We’d love your help. Let us know what’s wrong with this preview of Dialogues de bêtes by Colette. TOBY-CHIEN : Je n'oserais pas. Je l'aime «KIKI-LA-DOUCETTE : Elle a voulu - j'étais petit - me purger avec l'huile. Je l'ai si bien griffée et mordue qu'Elle n'a pas recommencé. Elle a cru, une minute, tenir le démon sur ses genoux. Je me suis roulé en spirale, j'ai soufflé du feu, j'ai multiplié mes vingt griffes par cent, mes dents par mille, et j'ai fui, comme par magie. To ask other readers questions about Dialogues de bêtes, please sign up. Is the book in French? I would only like to purchase a French edition. I used to own this book but seem to have lost my copy. Cynthia With this cover painting, yes. It's the folio edition en francais. I found mine at my library sale. For some unknown reason, I have never read anything by Colette. I don't remember now how I came across this title at Project Gutenberg, but it made me curious, especially when I saw it was a series of small sketches written like plays and featuring Toby-Dog (a French bulldog) and Kiki-The-Demure (a Maltese cat). It was originally published in 1904 so is one of Colette's earlier works. And it is absolutely delightful! There are seven scenes, such as Sentimentalities, where we first meet Toby and For some unknown reason, I have never read anything by Colette. I don't remember now how I came across this title at Project Gutenberg, but it made me curious, especially when I saw it was a series of small sketches written like plays and featuring Toby-Dog (a French bulldog) and Kiki-The-Demure (a Maltese cat). It was originally published in 1904 so is one of Colette's earlier works. And it is absolutely delightful! There are seven scenes, such as Sentimentalities, where we first meet Toby and Kiki and learn how each one feels about their chosen center of the universe. Toby's heart belongs to 'She' (the mistress of the house, Colette) but Kiki loves 'He' best (the man of the house, Colette's first husband, the novelist Henry Gauthier-Villars, known as Willy). I was impressed at the way Colette captured the personality of her household pets. Kiki is all feline grace and ego, very much a superior being who remembers the days of ancient Egypt, as all cats surely do. Toby is a sweet little dog, a bit naive, even a bit dense at times, but loyal and adorable. Both animals felt so real I half expected to find them curled up next to me while I was reading. We all go off to the country house in On The Train and when Kiki is allowed to slither out of his travel basket in their private compartment, Toby gets excited and tells him Proclaim your freedom I tell you! It's the custom. Whenever a door is opened one must run, jump, twist oneself into half circles and cry out. This was one of my favorite scenes, but so was Dinner Is Late and The First Fire. This book makes me want to read more by Colette, to see what her novels and journals are like, but this is the only title available in English at Gutenberg, so I will have to wait until Someday when I have more in the Book Budget and can buy a volume or three. Barks and Purrs is a collection of seven episodes in the lives of Toby-Dog, a French Bulldog, and Kiki-the-Demure, a Maltese cat, living in a comfortable household. The episodes cover a hot afternoon, a train ride, and what happened when dinner was late or their mistress was ill. We hear about the first fire in autumn, a heavy storm, and about a visitor in the household. All in all, this seems a little boring, doesn't it? Wrong, because these loosely linked snippets into their lives are addictive Barks and Purrs is a collection of seven episodes in the lives of Toby-Dog, a French Bulldog, and Kiki-the-Demure, a Maltese cat, living in a comfortable household. The episodes cover a hot afternoon, a train ride, and what happened when dinner was late or their mistress was ill. We hear about the first fire in autumn, a heavy storm, and about a visitor in the household. A humorous and often elegiac collection of short vignettes. As the book progresses darker undertones mingle with Colette's colourful palette to create moving short pieces. It's a delight to read. J'ai lu très lentement Dialogues de bêtes; un livre qui trainait et dont je lisais quelques pages à la fois seulement. J'ai adoré le style lyrique donné aux animaux de compagnie. Traiter des trivialités vécues par les chats et les chiens comme de grands drames grecques a rendu toute la lecture des plus agréables. Own a furry pet that is either a dog or cat? Read this. Colette captures the attitude and strangness of those that pet owners share thier lives with. Told as conversations between Kiki the Demure and Toby-Dog, the story concerns the pets' responses to various situtions, the most distressing being the late dinner. Immensely funny and immensely true. I rather enjoyed this little play. Well, it was read to me by librivox volunteers so it sounded a little like a play. Short, diverting, with oodles of character. I guess it goes to show that the attitudes we ascribe to pet dogs and cats haven't changed much in the last century. Fun read, especially for people with pets. 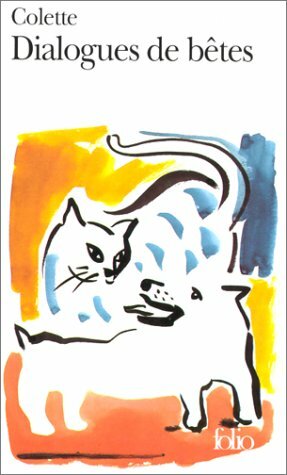 Written from the point of view of a dog and his feline companion, this book contains anecdotes presented in dialogue form which makes for an easy read. Not for serious readers, this book is exactly like its lead characters - a bit of fluff. The only part which I disliked was the excessively long ode to fire in one of the stories. In conclusion, it is a nice book to read when you have nothing else to read, a one-time read. Cute and clever conversations between a dog and a cat that live in a house with their humans. Despite this being translated into English, I don't think it loses any of the flavor of its original language. Even though it's rather old, it's still amusing and timely to read the well-known quirks of our pets in these pages. This cat-and-dog tale has some funny moments, but doesn't really develop beyond the dogs-are-from-Mars cats-are-from-Venus schtick. I have been looking for works that explain why Colette was so famous in the first half of the 20th Century. I guess I'll have to keep looking. I basically just read this because it was written by Colette. I wasn't sure what to expect. It was entertaining and sort of cute, as far as talking animals go. The actual copy wasn't great, some textual errors and wrapping issues, but nothing horrible. I guess this was an amazing book for the time it was written. Not so much now. It's written from the point of view of the dog and cat. I wanted to read something of Colette's writing; now I see I should have chosen another volume. It's as if Colette channeled Moliere into a Saturday morning cartoon. REALLY funny in some parts. Delightful, too, except for the extended scene at the fireplace; that grew tiresome. I could also see it as a stage play. It's not really just for kids. Le seul livre de Colette que j'ai lu. Sans doute pas le plus représentatif de sa carrière je suppose, mais cela m'avait bien plu à l'époque. Les dialogues étaient assez savoureux. Je ne pense pas relire de Colette cependant, mes goûts ont bien changer entretemps, pas sûr que j'accroche. Unusual and entertaining , and seeming to me completely accurate based on my own pets' personality. Clever little book. You must read Toby with an Almerican or English accent and KiKi with a bored French one!! On a more generous day this would be a four. It's amusing as both a cat owner and dog lover to read a book from animal perspectives. funny little book from kindle's free collection. not quite what i was expecting, but cute read for fellow fans of talking animal stories. Animal lovers, prepare to fall in love. Colette captures the characters of Dog and Cat perfectly, and provides a short, ultimately bittersweet, journey into their world. quite cute, though abruptly ended. fun to peek inside the minds of a French bull dog and grey tabby cat. I've always meant to read a book by Colette and I was not disappointed. It's an interesting concept, to see the world through the minds of pets. I'm not sure what I expected from Colette, but this was unusual and entertaining.